William Attmore, d. 1800 and Lida Tunstall Rodman Journal of a Tour to North Carolina by William Attmore, 1787. 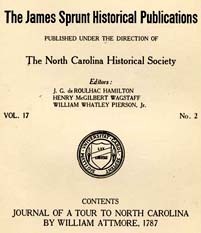 Journal of a Tour to North Carolina by William Attmore, 1787. Chapel Hill: The University, 1922. Attmore, William, d. 1800 -- Diaries. Attmore, William, d. 1800 -- Journeys -- North Carolina. North Carolina -- Description and travel -- Early works to 1800. North Carolina -- Social life and customs -- 18th century. Tobacco -- North Carolina -- Early works to 1800.